Our March 2019 newsletter is out now. Click here to read! 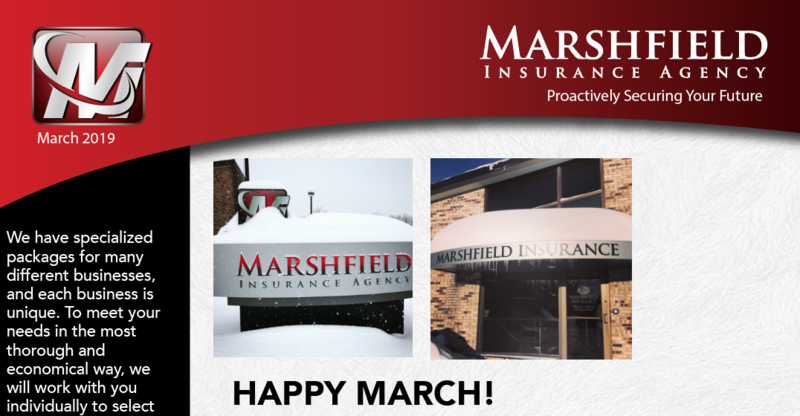 It’s been a snowy February here in Central Wisconsin, and here at Marshfield Insurance we.. Initiated by Nationwide in 2014, Grain Bin Safety Week is an annual campaign recurring the third full week of February to promote grain bin safety on..
A slip and fall accident can occur in almost any location – from a wet floor in the grocery store to a dangerously uneven sidewalk. This.. Snow removal can be hard on the body when you have to clear a large area with only a shovel, especially after a heavy snow. Using..
It’s that time of year again – don’t ignore those audit forms! An insurance audit is done is done after the policy expires and is used..